Shake the ground with 10,000 watts of earth-shattering TMBG funny car power. It's the NASCAR shirt. Printed in long sleeve with branded racing stripes on the sleeves. 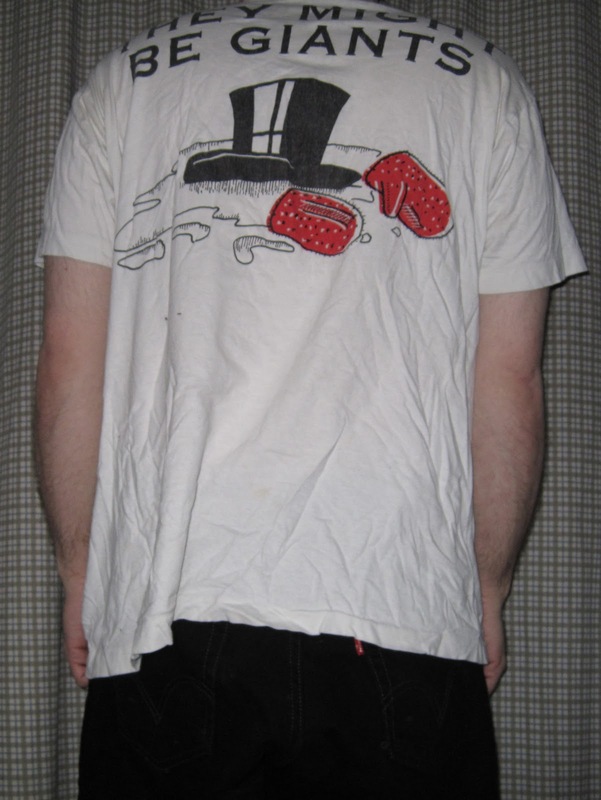 My favorite part about this shirt is that it sports the band's name (or its initials) a stunning eight times. Designed by graphics wiz Mike Mills, who also created the John Henry, Back to Skull and Snail Shell single covers. 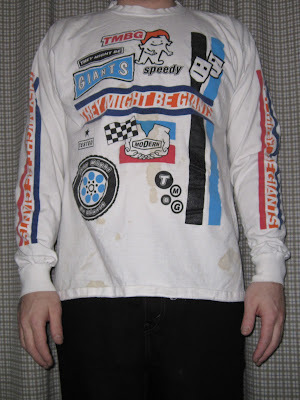 Authentic pit crew oil stains not included. 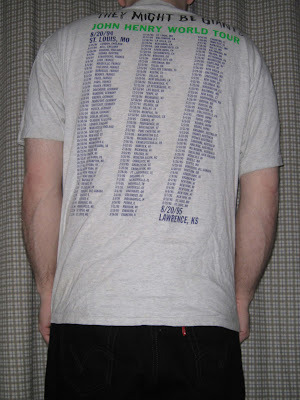 As indicated on the back, this print is number two in a limited edition series of one hundred shirts. Just kidding. 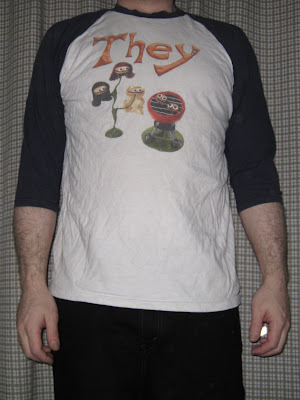 I do in fact have a legitimately rare short-sleeved version of this shirt, which I wear much more often. My sister came across it in a thrift store for three dollars while vacationing in Florida, and brought it back for my amazement. I have never seen another one of these, anywhere. It's rare-wear! John Flansburgh talks about the origins of the song's title and who it pissed off. Performed at Irving Plaza in New York City on 2/21/97. They Might Be Claymation. On a shirt. Without the 'mation. Requested by Gabby. The front of this "baseball tee" features a "Meatclown" anthropomorphic hamburger tree, as well as a couple ocularized burgers being grilled. The "unpicked" bunned patties seem to have have grown some pretty, lustrous hair. Nothing weird about that. Above, the band name is begun with a golden, jewel-encrusted "They". Admittedly, I don't wear this shirt as often as many others because I'm not a big fan of the 3/4 "baseball tee" sleeves. 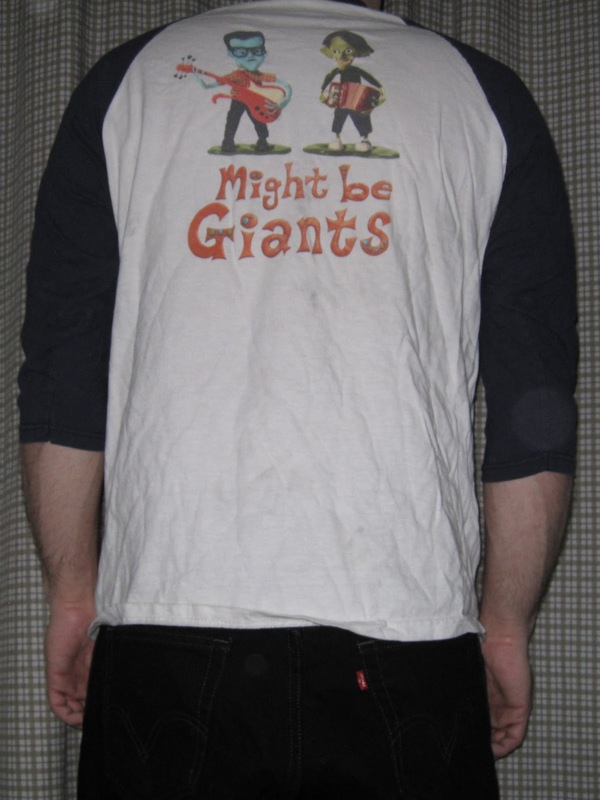 Designed in 2003, you can still purchase "Gumby on White/Navy" at the TMBG Merch Store. "I went to see the LA premiere of Gigantic (the documentary about the band They Might Be Giants) and gave a copy of Boobie Girl and Meatclown to John Flansburgh after the show, just as a fan. Well, a few weeks later I received an e-mail from them asking me to design a t-shirt for their next tour, they wanted puppets of themselves made in the style of Meatclown (embedded below) …Here they are!" 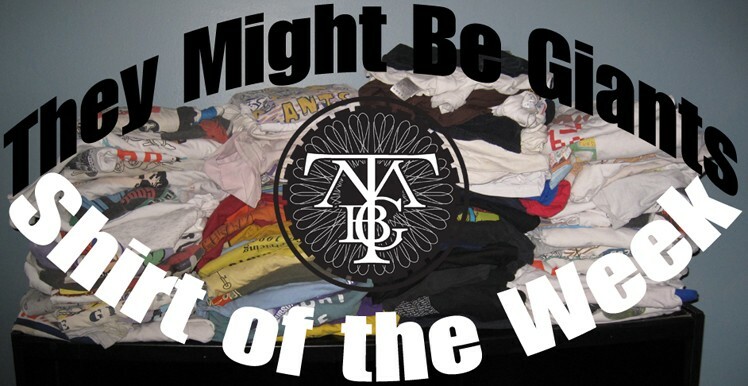 This week's shirt is simple but sweet: it's the WDTTS? Happy Guy! In all his purple glory, it's.. a guy. Let's call him, 'Guy'. He's quite happy. In fact, it looks like he may want a hug. 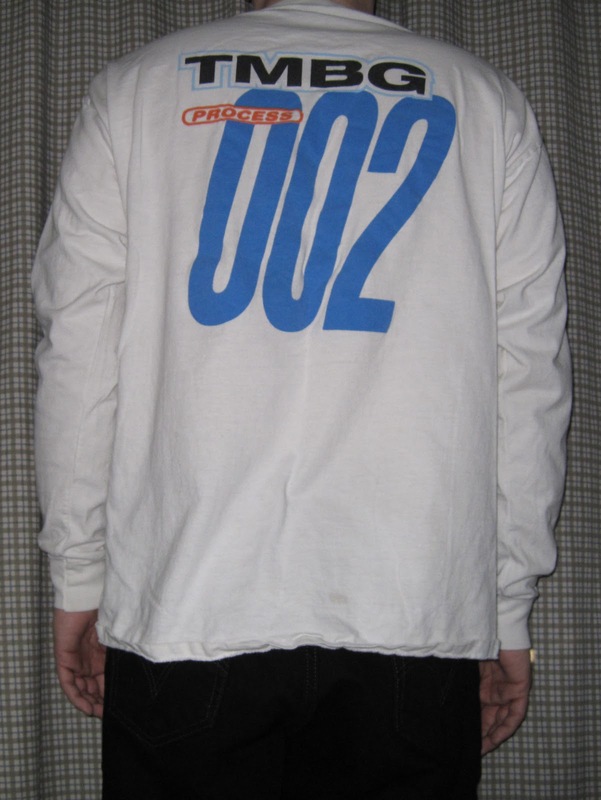 Have I ever gotten a hug for wearing this? No. But I can dream, can't I? 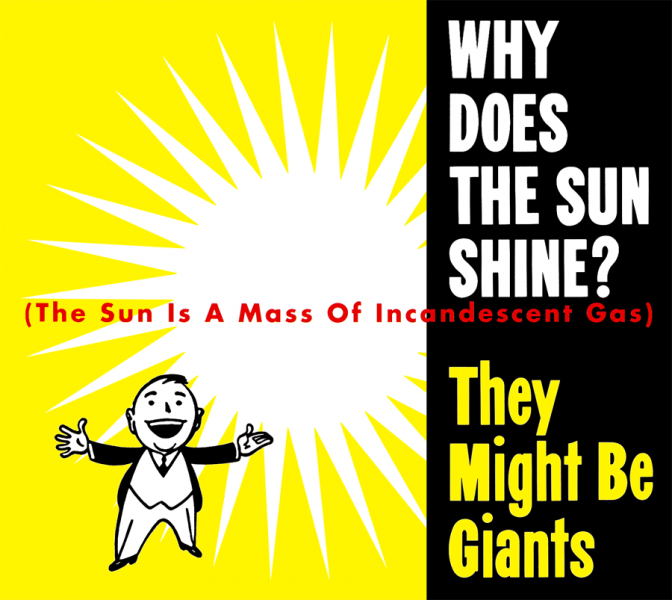 Guy originally appeared on the 1993 EP cover for "Why Does The Sun Shine?". Guy is clipart from the 30s or 40s which was created by the Stivers Studio in San Francisco. 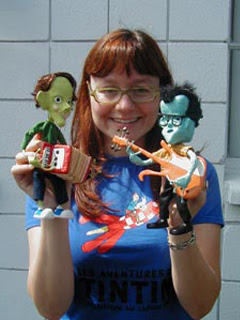 John Flansburgh came across it and passed him along to Megan Montague Cash, designer of the EP cover. WDTSS? is a cover of a song originally from the 1959 Space Songs album by Hy Zaret and Lou Singer. There are also lovely covers on this EP of The Allman Brothers' "Jessica" and "Whirlpool", originally by Meat Puppets. Incidentally, Curt Kirkwood of the Puppets designed a TMBG shirt himself, which you could keep an eye out for in the coming weeks. 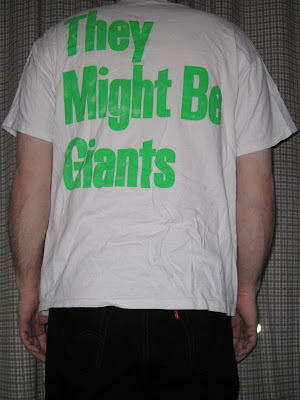 The back of the shirt proclaims THEY MIGHT BE GIANTS in the same font used on the EP cover, though in large, florescent green lettering. This is one that you can still read after I'm a block away, folks. I'll leave people wondering, "Who was that Guy??" In honor of The Monkees' 45th Anniversary Tour, here's John & John covering a Monkees tune. Performed at Quiet Life in New York City on 12/31/89. What are you staring at? Haven't you ever beheld an animated snowman being brazenly broiled by a blazing buildup of billowing banknotes? Why would he do such a thing?? Well, I suppose that Frosty has decided to off himself in style; he's even smoking a cigar with a mischievous grin. With his overt obliviousness of the irresistibly inexorable irony, this stylish softening snowman is anything but abominable! 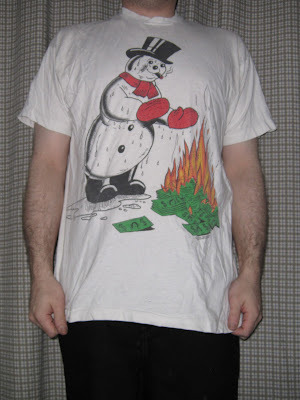 I have a total of nine different versions of The Snowman Shirt, including two sweatshirts. This is my personal favorite , in stunning color on white. The back of the shirt pictures what's left of poor Mr. Snowman; just a puddle, his pair of mittens and top hat. What happened to his scarf and galoshes? We may never know. 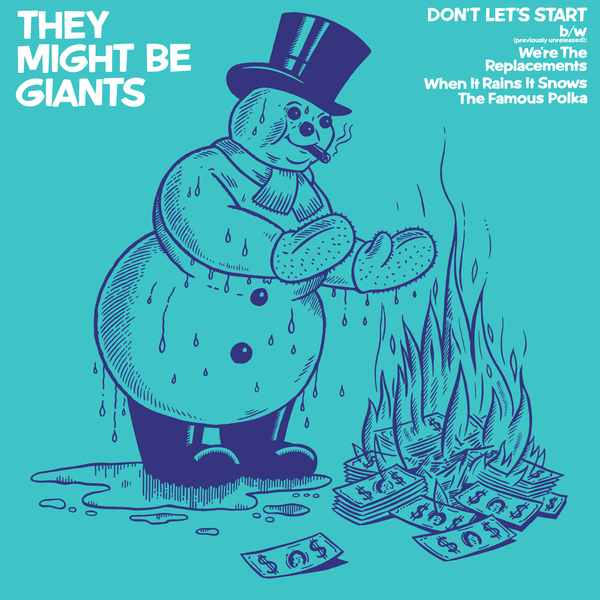 Illustrated by Mark Mazut, this seminal TMBG drawing first appeared on the 1987 Don't Let's Start EP on vinyl, which features When It Rains It Snows as a b-side. Coincidence? I think maybe! Here, a somewhat smaller Snowman is drastically dwarfed by the band name. I also have this one in reverse, with black printing on a white shirt, and nothing on the back of either. 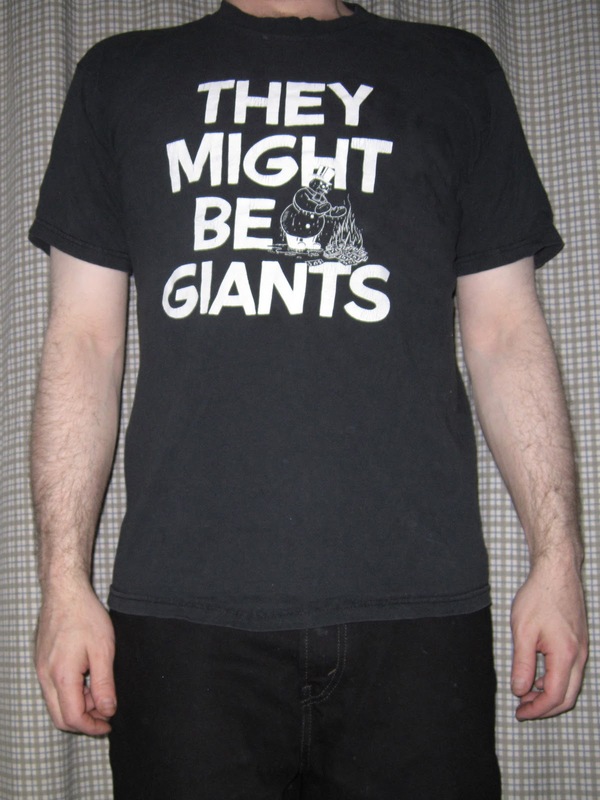 "Snowman on White" and "Snowman on Black" are both currently available on the TMBG Merch Store. 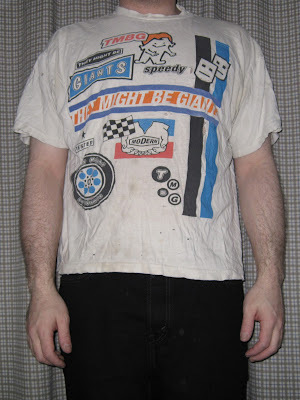 This one is a ringer shirt with the band name on the back instead. I also have this permutation in orange, and another that's white. 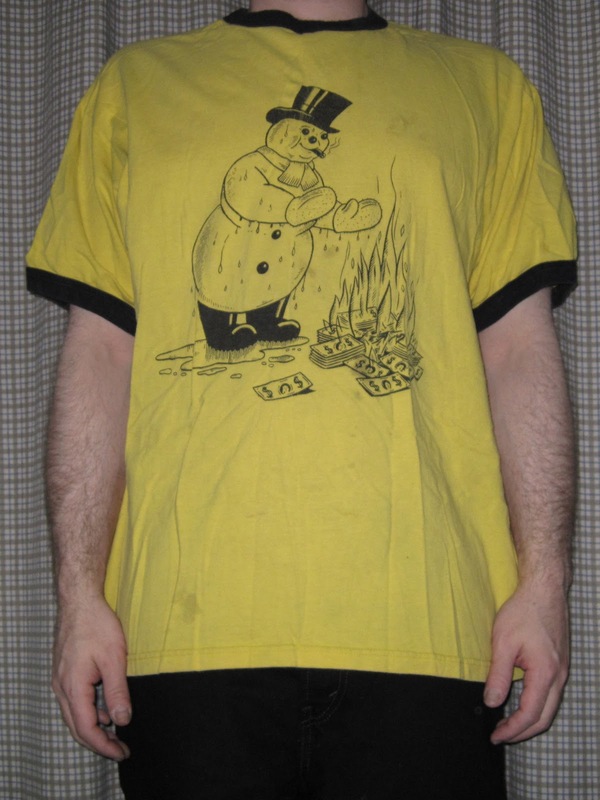 "Solo Snowman on Black" is also available on the TMBG Merch Store, which has white printing on black, without the rings. I don't own that one.. yet. Let's go for ten! This is a 20th Anniversary Shirt, as it says on the back along with the name and slogan. I also have a tour shirt version which is similar to my favorite, with Mr. Snowman bigger then ever, though with less color. 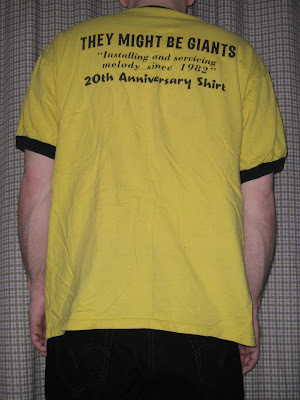 It's the "John Henry World Tour" t-shirt, with '94-'95 dates listed on the back including my second and third shows, in Red Bank, NJ and Asbury Park, NJ respectively. 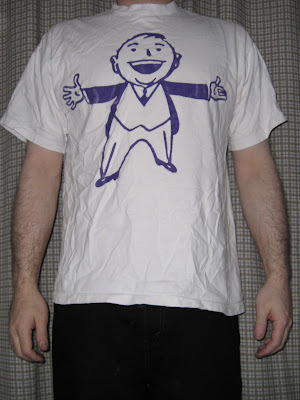 I don't remember this being sold at those shows, but then, it was a long time ago. 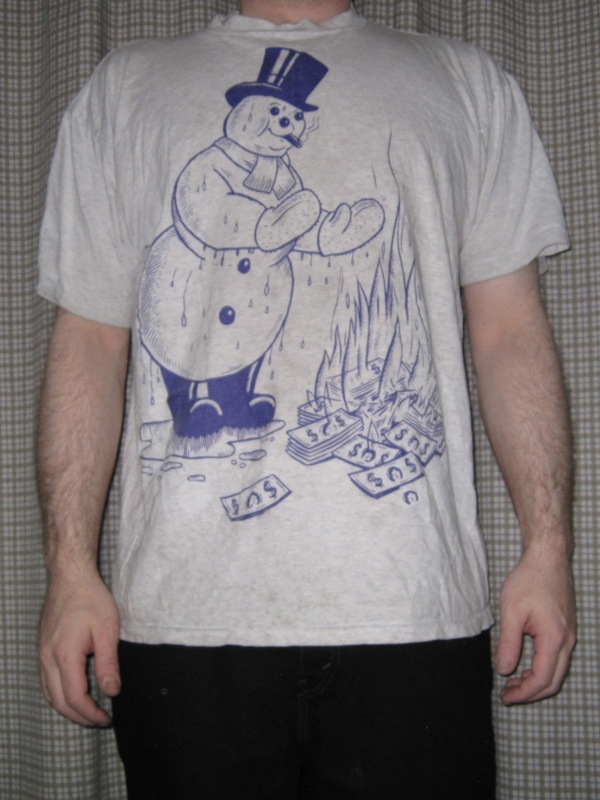 The Snowman design is also on a couple of sweatshirts, again available in the TMBG Merch Store. There's the original "Snowman on Black" pullover hoodie, above as well as the newer "TMBG Road Crew on Brown" zip-up hoodie, with the Snowman on the back. This Del Shannon classic sounds awesome with accordion! Performed at the Modjeska Theater in Milwaukee, WI on 10/5/92.